There are 3 upcoming events for your entertainment at Henrico High: Visual Arts Spring Showcase Saturday, April 22, 5-7pm (free). Musical Theatre Spring Showcase Friday and Saturday April 21-22 at 7:30pm ($5). 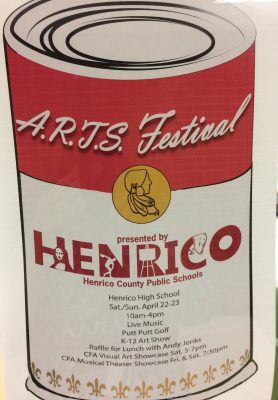 HCPS county-wide Arts Festival April 22 & 23, 10am-4pm (free).